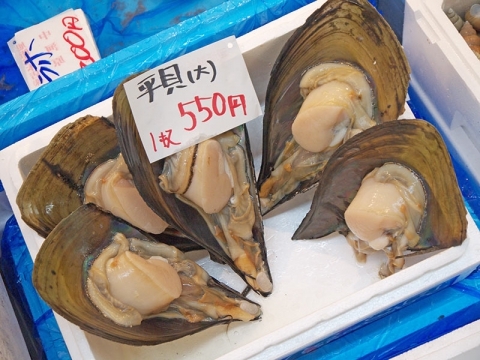 Tsukiji Fish Market is the biggest wholesale market, trading mainly on fish, as well as fruits and vegetables in the center of Tokyo. The most famous of the ten wholesale markets in which there is a distribution of fish and meat in the capital Tokyo. 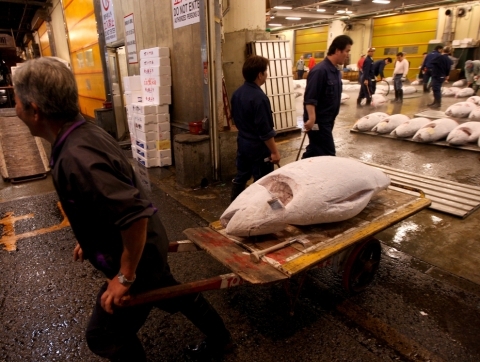 Tsukiji is known as one of the world’s largest fish market, which handled more than 2,000 tons of marine products per day. 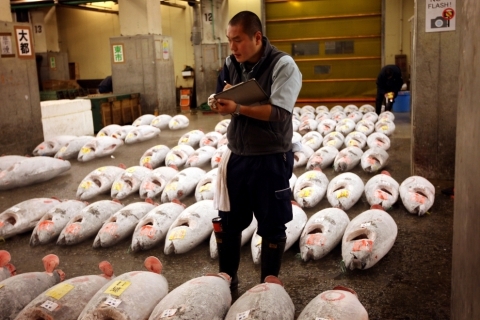 The market consists of the domestic market, where there are major deals in the wholesale, also known tuna auctions, and the external market, where there are retail shops and restaurants open to private visitors. Several restaurants are located in the internal market. The number of visitors to the tuna auction is limited – 120 people per day. Tourists who want to see the auction must apply for Osakana Fukyu Center (Fish Information Center) near Kachidoki Gate. Acceptance of applications starting from 5:00 am. The first group of 60 people visited the auction with a 5:25 to 5:50, the second group of 60 visitors – from 5:50 to 6:15. We must bear in mind that all of those wishing to see the auction starts to line up well before 5 am. The wholesale market is made up of hundreds of small and large counter in the crowded room, where buyers and sellers rush through the narrow aisles with carts or trucks. It is interesting to observe the work of the Japanese involved in the industry. Before 9am tourists do not allow the wholesale market, as it accounts for the peak time of business activity. 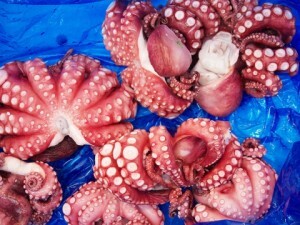 But even after 9 am, you can see many interesting things in the life of the wholesale fish market. The retail market or the so-called external market Tsukiji, is interesting because here you can buy anything from a huge number of (fresh, frozen, dried, cured) presented here of fish and marine life in any way, as you can buy fruits and vegetables . We recommend must-visit in the morning one of the many restaurants and enjoy fresh fish. 1. Do not enter the premises for staff. 2. It is impossible to prevent movement and free passage. 3. It is impossible to carry on the territory of large bags and suitcases. 4. It is not recommended to come to the market on the heels and open shoes. 5. On the market are not permitted entrance with small children and pets. 6. Do not smoke on the territory of the market. 7. At the auction, and in the wholesale market can not touch anything. From 5:00 am to 14:00. 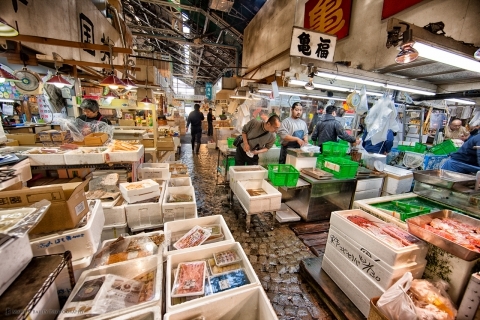 The wholesale market is open to private visitors from 09:00 am. It does not work on Sundays and public holidays. Auction closed for tourists during the New Year period. This year did not work with the December 2, 2013 g on January 18, 2014! Location: 5 Chome-2-1 Tsukiji, Chuo, Tokyo 104-0045, Japan. From Tokyo Station (M17) come up on st.Ginza (M16) , transplanted in the art. Ginza (H08) and eat up art. Station then Tsukiji (the H10) . The journey takes about 15 minutes. Cost 160 Jap. yen. From Art. Shinjuku Station (E27) direct line to art. Shijo Station then Tsukiji (the E18) . The journey takes about 20 minutes. Cost 260 Jap. yen.